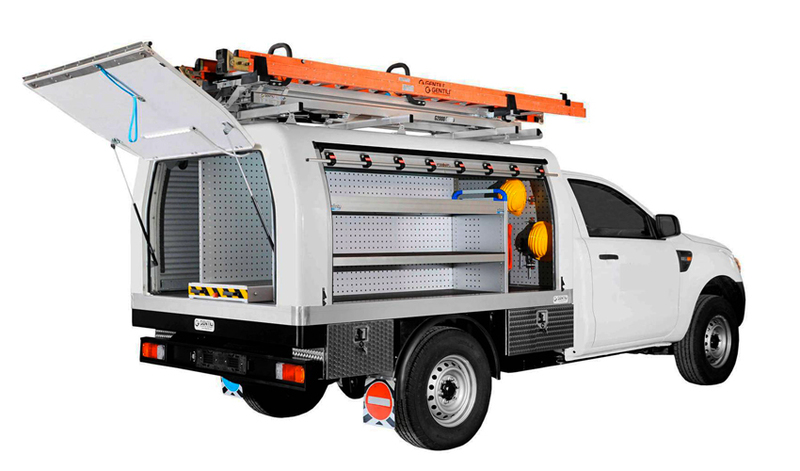 The racking systems for pick-up trucks are the best solution to make these vehicles more performing. 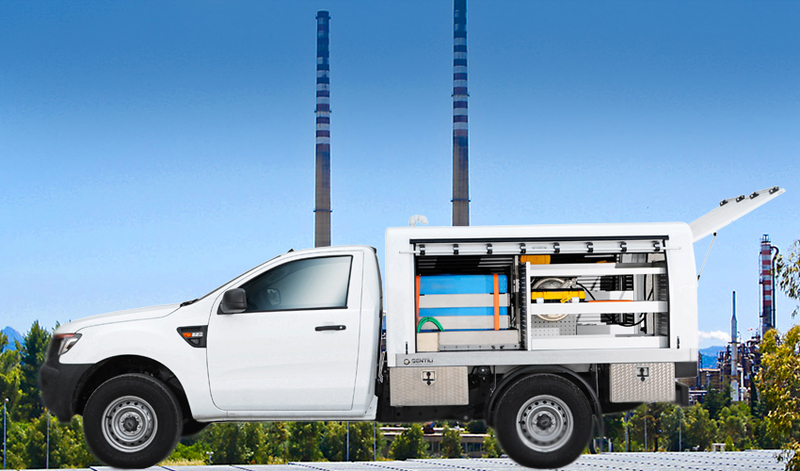 Nucleo by Gentili Technology Equipment transforms every pick-up truck into a perfect commercial vehicle. 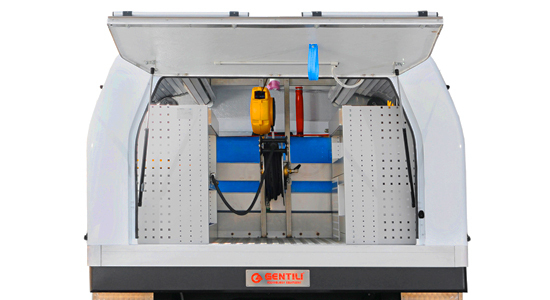 Gentili’s engineers have specially designed a flexible product that can perfectly adapt to become a mobile workshop on vehicles with no sheltered space for storing work equipment or tools. 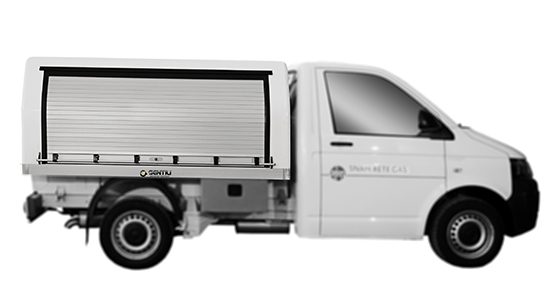 Thanks to the power of four wheel drive, the module is positioned on the vehicle and can travel on unpaved roads to reach difficult places thus satisfying the more and more specific and different needs of multi-utility service providers. 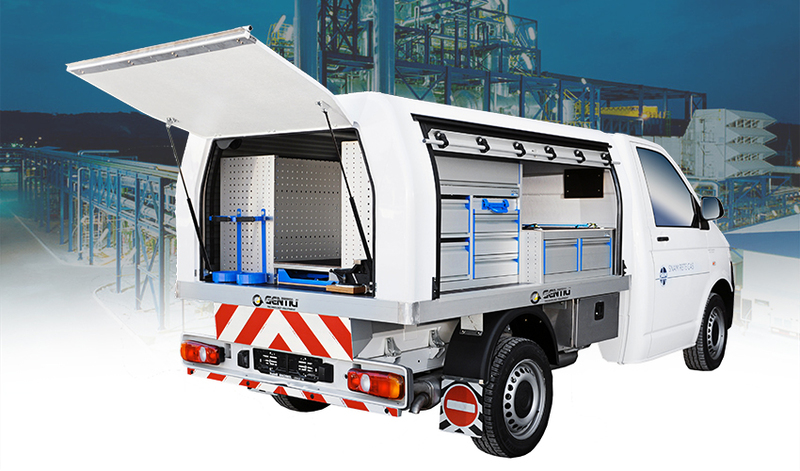 Gentili’s racking systems for pick-up trucks ensure the best performances thanks to the design specifically studied to meet the needs of operators working in difficult situations. 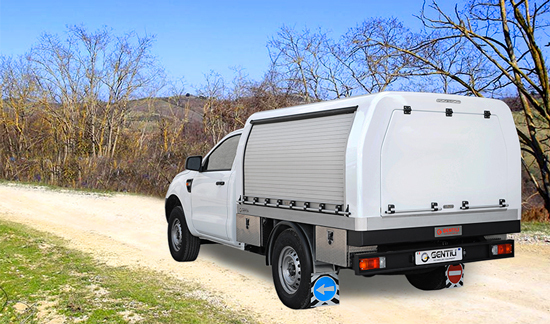 Nucleo, the racking system for pick-up trucks, is manufactured by means of one moulded fibreglass piece. The thickness is 4 to 6 mm in the structural parts. Steel reinforcing elements are inserted in the fibreglass to create a robust and load bearing structure. They also allow to fit the G2000 ladder rack on the Nucleo roof. 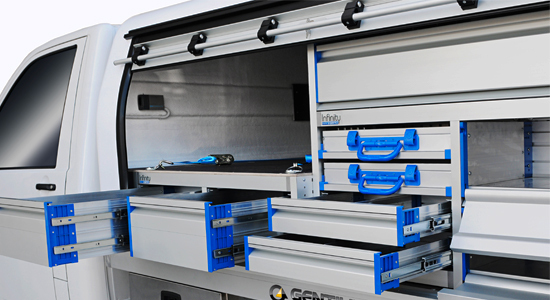 Two lateral anodised aluminium rolling shutters allow the operator to easily access the load area. The shutters are equipped with guides, winders, drip kit and lock key. An aluminium profile as long as the shutter can be used as handle to open/close it. At the rear, Nucleo is fitted with a horizontally-hinged door servo-assisted by no. 2 gas springs. The rear door allows to fully exploit access to the load area. The door is equipped with handle, key and third brake light. Welded and painted steel frame with 18mm-resined birch multilayer platform with non-slip surface in the load area. No. 2 edge protections in painted sheet are applied at the edges of the platform. Fibreglass Nucleo is fixed to the steel frame, whereas the structure is secured to the vehicle chassis by means of no. 3 tubular cross-members – 70 x 30 x 3 mm – and special moulded steel brackets and bolts.